Well, a rollercoaster that buzzes constantly, that is. 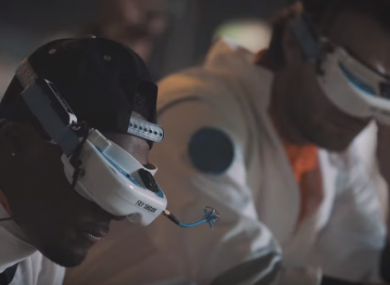 DRONE RACING MIGHT not be at the same level as other mainstream sports like Formula 1 but its popularity over the last year has grown with numerous competitions being held across the world. The biggest one, the Dubai World Drone Prix, was held over the weekend with the winner taking home more than €220,000 – out of a prize pool that was just under €900,000. What makes the competition unique isn’t the fact that drones are being flown around, but how they’re being controlled. Unlike RC racing where you get a high vantage point so you can see the track, pilots have to wear special headsets so they can have a first-person viewpoint. The result is a somewhat nauseating experience as a drone is raced around a rollercoaster-like track – with one instance of it having to fly up to overcome a hill – while the constant buzzing from the motors continues. More than 2,000 people turned up for the event which saw the British team Tornado X-Blades Banni-UK beat the home team Dubai Dronetech for first place. Ireland, in particular, is quickly becoming a destination for drone testing and has seen usage by both hobbyists and companies grow. Back in December, the Irish Aviation Authority (IAA) introduced new regulations which required any drone weighing more than a kilo to be registered. While the main use for drones tends to be for capturing landscape shots, there are those who race them competitively. If you want to watch a race closer to home, The Drone Expo Ireland, which will be held at the beginning of April, will be holding its own in the RDS in Dublin. Email “Watching this drone race is a lot like riding a neon-lit rollercoaster”. Feedback on “Watching this drone race is a lot like riding a neon-lit rollercoaster”.